The stock market now has to judge each economic report on its own merit, without the expectation that any weakness would drive the Fed to consider easing policy. That's because the Fed has put itself on hold, promising to pause in its rate hiking and wind down of its program to shrink its balance sheet in the second half of the year. The real test for markets is whether the weaker data on business and consumer spending are just temporary because of uncertainty over trade and the government shutdown, as many economists suspect, or signs of a bigger slowdown ahead. "I think we're at a precipice, where the intentions of the Fed are well known," said Art Hogan, chief market strategist at National Securities. "So they're on pause until the data improves. They're certainly going to use their balance sheet as a stealth stimulus, and the stock market just had a significant run." The stock market on Thursday slumped after a string of reports that missed expectations. 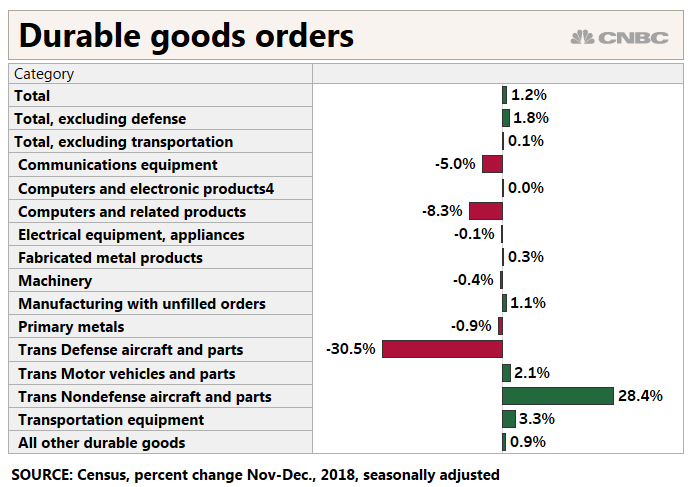 December's durable goods data showed a surprise slowdown in business spending. The Philadelphia Fed manufacturing survey fell to minus 4.1, the first negative number since May 2016 and the biggest drop since August 2011. Markit PMI data also showed manufacturing activity at the slowest pace in 17 months. Previously bad data like that might have sent stocks higher. "It helped drive our perception of monetary policy because it was going to influence the Fed's pivot," Hogan said. "Now, the Fed has made their pivot. We know where they stand and incrementally bad news is not going to change their position." Some really bad data, however, could have a negative effect. The Dow fell 104 points a week ago Thursday, after December's retail sales report showed a sudden, unexpected drop of 1.2 percent in spending, at a time when consumers should have been shopping for holiday gifts. Some economists wrote off the number as suspect, but it still rattled markets and sent Treasury yields lower. Yields move opposite price. "The loss of economic momentum appears to have carried over into the first quarter. In light of both a quiescent inflation backdrop and a projected downshift in GDP, imply an increased likelihood that the Fed's next move in interest rates is lower," wrote Joseph LaVorgna, chief economist for the Americas at Natixis. But one problem is that the government's 35-day shutdown, not only could have been a temporary negative drag on the economy, but also slowed the release of economic reports, creating an even murkier-than-normal look at economic activity. "The data we've been looking at recently is just like all over the map. There's no really clear pattern to things," said Ward McCarthy, chief financial economist at Jefferies. "Some things look really bad, some things look good, some things look in the middle. The data that was the most trustworthy was the durable goods number which continues to show the drop off in capex spending and according to the survey data, it's due to uncertainty over the trade war." Stocks have been boosted by optimism over trade talks with China, but it's clear the Fed has been watching the impact of trade on the economy as one of the risks behind its decision to hold off on rate hikes. When the Fed first began discussing a potential "pause" in rate hikes in December, stocks were selling off and the markets were gripped by fear of a potential recession. "The Fed put itself on the shelf. …They basically have just said we're going to be patient with everything. If you get bad data, they're going to be patient with that," said McCarthy. "The Fed just wants to be in the backdrop, and I think that's a good place for them to be, not just because of the way the data looks but because of all the uncertainties which could be disruptive, like trade and politics. As a consequence, they want to make themselves removed from the scapegoat role."